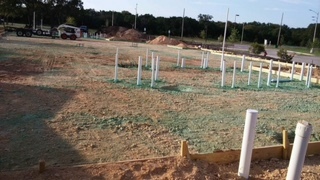 The framing of the foundation boundary and the plumbing work are complete and inspected by the City. Termite treatment has been completed and inspected as well. Electrical & other low voltage contractors visited the site and no sleeves were needed under the foundation. Delivery of foundation steel has been delayed. Service contract with our structural engineer has been signed to get professional expertise and approval of shop drawings. Soon after the Engineer’s approval, foundation steel will be in place for the (foundation) pad. Pouring of concrete for piers has been re-scheduled for next week. The steel frame for the foundation pad is expected to be ready within one week, InShaAllah.